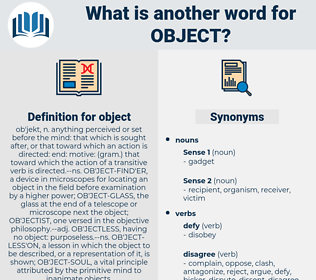 What is another word for object? ob'jekt, n. anything perceived or set before the mind: that which is sought after, or that toward which an action is directed: end: motive: ( gram.) that toward which the action of a transitive verb is directed.-- ns. OB'JECT-FIND'ER, a device in microscopes for locating an object in the field before examination by a higher power; OB'JECT-GLASS, the glass at the end of a telescope or microscope next the object; OB'JECTIST, one versed in the objective philosophy.-- adj. OB'JECTLESS, having no object: purposeless.-- ns. OB'JECT-LESS'ON, a lesson in which the object to be described, or a representation of it, is shown; OB'JECT-SOUL, a vital principle attributed by the primitive mind to inanimate objects. pieces, functions, Publications, audiences, Appendices, Rights, bucks, purposes, subject-matter. coordinates, Focuses, intention, subject-matter, victim. avoidance, negligence, nonentity, method, thoughtlessness, purposelessness, aimlessness, neglect, means, heedlessness, way, oversight, carelessness. agree, endorse, give in, concur, praise, help, accept, consent, compliment, approve, sanction, go along, aid. But to return to the object of Dr. Jervis's visit. Stirling stooped and picked up the object. centre, center, infatuation, execration, antipathy, hallucination, center of attention, hobgoblin, bugbear, centre of attention, passion, love. object of a preposition, direct object, object of the verb, prepositional object, indirect object, retained object. lot, peculiarity, location, web, commemorative, filler, terra firma, hail, good luck charm, hoodoo, discard, makeweight, formation, portion, je ne sais quoi, prop, ground, head, part, finding, earth, oddity, snake, thread, triviality, curiosity, neighbor, trivia, wall, keepsake, shiner, paring, property, vehicle, whole, soil, small beer, solid ground, neighbour, film, remains, token, oddment, draw, geological formation, ribbon, fomite, curio, souvenir, unit, rarity, catch, moon, stuff, dry land, land, trifle, relic, ice, floater, charm, growth, vagabond. demur, challenge, remonstrate, except, carp, mind, chicane, raise hell, cavil, raise a stink, make a stink, take exception. computer science, mental object, computing, content, cognitive content.